Funding of $5000 each is being sent to Western Samoa and American Samoa to help with urgently needed repair and replacement of football infrastructure and equipment such as buildings, playing fields and goalposts, NZF Chairman Frank van Hattum said. The damage to Football Federation American Samoa’s waterfront national headquarters at Pago Park in Pago Pago was extensive. The offices were flooded and damaged; a tool shed, water pump, garage and storage shed were swept away and the playing field flooded and coated in oil and debris. FFAS groundsman Paepae Soia Su was the only staff member there when the tsunami struck. He ran from the huge wave but was caught by it and swept inland. He escaped with his life by clinging to a tree. Soia Su’s truck disappeared in the flood and hasn’t been seen since. 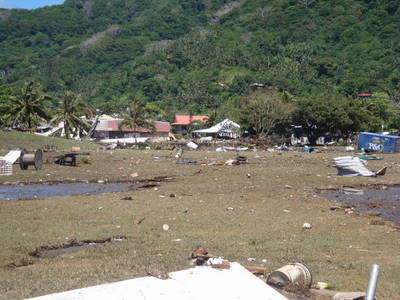 In Samoa the tsunami was just as devastating but the offices of the Samoa Football Soccer Federation (SFSF) and the J.S. Blotter Football Complex just 10 minutes from downtown Apia provided refuge for hundreds of people as they waited for news about their homes and family members. “Our Oceania partners are in crisis and New Zealand Football has decided to provide some financial assistance to help with urgent needs and assist them to rebuild,” van Hattum said. New Zealand won the OFC to earn a playoff against fifth-placed Asian team Bahrain for a place in the 2010 FIFA World Cup. The second leg of the playoff is being held in Wellington on November 14 in front of a capacity crowd. “We are mindful of the fortunate position we are in with tremendous support coming from the public for our World Cup bid, while our Oceania friends are suffering,” van Hattum said.